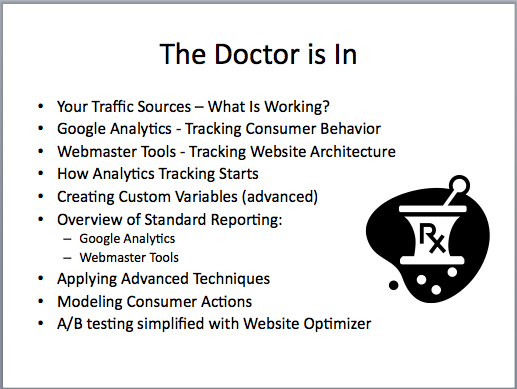 Google Analytics and Webmaster Tools Webinar – What did you think? Our Google Analytics and Webmaster Tools Webinar has come to a close and despite some early technical issues (sorry about that), the feedback was very positive. LOTS of great information along with many questions were being asked. Brian was just scraping the surface of Google Analytics and Google Webmaster Tools and how dealers can leverage these 2 awesome tools. Several topics were covered, including..
We hope everyone gathered with some great information today. Even if you can’t apply everything you learned today, it’s great to have this knowledge so you can hold your website providers and SEO consultants accountable! Thanks to everyone that supported and attended! Let us know you thought? Great webinar today. I wasn't very familiar with Google Analytics or Webmaster and was afraid I wouldnt be able to keep up. But job well done. I'm excited about how these tools will help me. Can't wait for session 2 and 3. I was really pleased with the content that was covered today. Even though I'm a vendor these best practices can be applied to any business. Plus, I love dealing with the "internet manager" and knowing more than them. Hopefully the attendes can get copy of this to keep in the archives. Thanks again offering the Webinar today. The tools you dove into are invaluable tools for any webmaster in any industry. Best of all they are free tools that any of us can use to help better determine ROI for the marketing campaigns we are running. Please let me know if you offer the 102 and 103 version of this seminar or others in the series. Again I appreciate all of your help and one thing that needs to be echoed from your talk: Companies need to learn: By working together to better the industry as a whole they are increasing their business profitability. I hope they realize that in time to jump on board with some of your ideas. Very well done and informitive webinar today. While there is so much to Google Anylitics and Webmaster tools you we're able to keep it simple and understandable. I know that I hadn't been useing both the tools to full advantage but I saw many features that will be helpful today. I'm sure the problems at the begining were caused by those last minute registrations ;-). Plus I have to keep up with vendors like Ryan!!!! Lou you are right if they would stop being so propriatory and just do what is best for the industry we would all sell more cars and spend more on the products offered. I was very happy with the webinar today. We work with Dealer.com and have the link to google analytics so I thought we were all hooked but I did find out that we were not. So I sent the code to my rep and voila! I learned a lot about the different things that google has to offer. Thank you for the information and I too am looking forward to the next sessions. Awesome content and a great walkthrough. Picked up on a good deal of stuff I hadn't really gotten dirty with. Honestly, I needed that… it was a good brush up and opened some new doors. Looking forward to the next sessions and wanted to suggest a possible "pre-requisite" check list for the next so we can really dig in on some of the more advanced utilities, especially goals. Great stuff. Looking forward to the upcoming events. Excellent webinar! Thank you Brian! I came in late but was able to catch up quickly. Hope we get a copy of the webinar soon. We use Cobalt and do not pay extra for a ProCare advocate – I am learning how to do it and am so excited to dig into Google Webmaster and Analytics. Just waiting for Cobalt to add the link. Looking forward to the next webinar. Thanks everyone for all the positive feedback. It's great to hear so many of you got your money's worth. Not only are we getting the positive comments here on the blog but we received several personal emails and tweets as well. If anyone has any questions that were NOT answered during the webinar, feel free to ask here and we will be sure to include the answers in a future webinar or article here on the blog. Thank you for doing this webinar. I am very much looking foward to the Part 2! Please let us all know when that will be available. I am excited to gain more in depth knowledge about how Analytics and WebMaster can really help us come forward! Fabulous webinar! I am really anxious for the next one. Also, I am shocked to learn that many web providers do not let their customers look at Webmasters Tools. Those tools are essential to understanding SEO and making sure you are getting as much traffic as possible. Which has to be a team effort, not just in the hands of the web provider. And thanks for reminding us to watch our own keywords, it can be surprising when you look back that you don't use an important keyword often enough. I am kind of wondering if anyone fired their web provider after this informative webinar. Great webinar. learned a lot of good info that we will put into place asap. very interested in part 2. Thanks for making the life of a car guy a little bit easier.